The New York Rangers will complete the final leg of their four-game trip across Western Canada tonight, traveling to the MTS Centre to face the Winnipeg Jets. The Jets (2-4-1), playing in the Eastern Conference’s Southeast Division–for the time being–are in the early stages of their first season back in NHL action. For example, the last time the Jets hosted the Rangers (November 17, 1995) Mariah Carey’s “Fantasies” was finishing up an eight-week stint as the No. 1 song in the United States. Coolio’s Gangsta’s Paradise was the top song for the year, according to Billboard Magazine. For all you wrestling fans, 1995 marked the dawn of the “Monday Night Wars,” as WCW launched Monday Nitro to compete against the then WWF’s Monday Night Raw. NBC continued to dominate ratings, having three of the top 10 shows on network television, with Seinfeld leading the pack followed by ER and Friends in their second-year of production. Braveheart scored the Academy Award for Best Picture and Best Director, while Ace Ventura: When Nature Calls was the biggest film in the box office for that week. Although the official date was in 1996, the Dallas Cowboys won their fifth Super Bowl, ending a run of dominance throughout the early-90s. The Rangers had three Ferraro’s on the team: Brothers Chris and Peter, and Ray Ferraro, who was traded to Los Angeles midway through the year. The trade brought Jari Kurri, Marty McSorely and Shane Churla to the Blueshirts. Speaking of Ray Ferraro, 1995 marks the last time the Rangers had two balls of hate on the team at the same time: Ray Ferraro being the “Big Ball of Hate,” while Pat Verbeek was the “Little Ball of Hate.” Both nicknames were given to the feisty wingers by backup goaltender, Glenn Healy. A sprightly 23-year-old Keith Tkachuk, posted his first 50-goal season, leading the Jets with 98 points. Another 23-year-old, Nikolai Khabibulin, was enjoying his first season as a starting goaltender, posting a 26-20-3 record for the Jets in ’95. 1995 marked a miserable year for the Western Conference, as five of the eight playoff teams that made the playoffs had a sub-.500 record. The Jets were one of them, taking the eighth spot with a 36-40-6, good enough for 78 points. The Rangers, on the other hand–just two seasons removed from a Stanley Cup victory–were the third-best team in the East, with a 41-27-14 record. 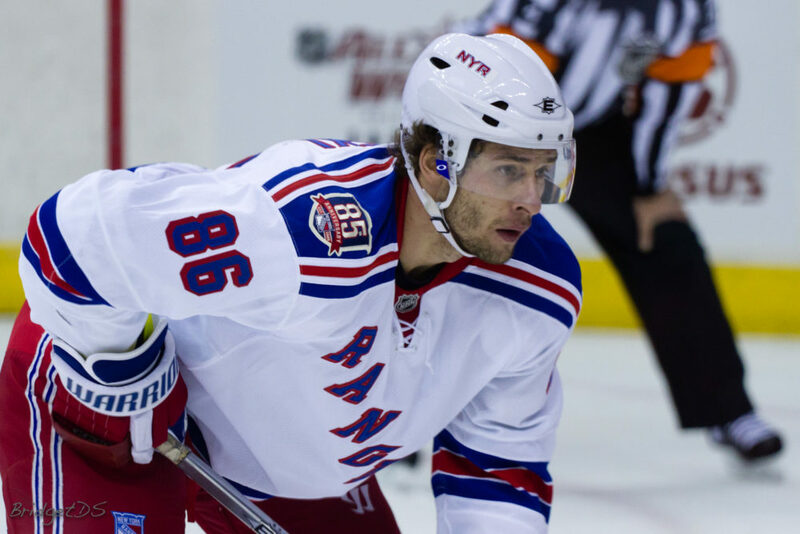 Wojtek Wolski will return to the lineup for the Rangers, after missing five games with a groin injury. Wolski, who had been slated to skate on the opposite wing of Marian Gaborik on the Rangers’ top line with Brad Richards prior to the injury, might be able to help jump-start the Rangers’ anemic power play. Fun Fact: Wolski was traded to the New York Rangers last season by the Phoenix Coyotes–the original Winnipeg Jets. The Rangers have the worst power play in the NHL, with a disgusting 4.4-percent success rate. The Blueshirts have only been able to muster up one goal on 23 attempts thus far in the early stages of the season. Another big change to the Rangers’ every day lineup: Martin Biron will also get his first start in net of the season. It had been rumored that goaltender Henrik Lundqvist had injured himself in the Rangers’ 2-0 loss to Edmonton Saturday night, but he claims he is 100-percent healthy. Lundqvist told the NY Post that his “foot cramp” was due to a skate-related issue, and wont be a problem going forward. Tonight would be a good chance for Biron to play, in any case, as Lundqvist had played the first six games of the season, facing just over 32 shots-per-game.